Check-in: from 12.00 a.m. to 01.00 p.m. The Miramare Hotel is really unique. Located on the first and second floor of the beautiful Devoto Palace (one of the most impressive historic houses at the end of the '800s), the Miramare Hotel is centrally located on Via Roma, facing the harbor and overlooking the center of Sardinia. The small Hotel Miramare is a charming building with 18 rooms - 4 suites, all equipped with TV, air conditioning, minibar, private bathroom and telephone. 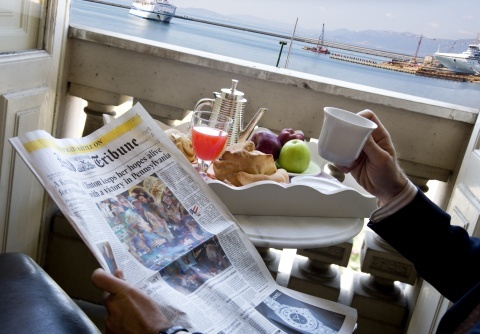 Hotel Miramare enjoys an enchanting view over the port of Cagliari and the sea, beautiful breathtaking sunrises and sunsets. a different experience, in the heart of the oldest town on the island for a nice stay in the finest details. The Miramare is located very close to the sea and the new Portum Karalis, renovated marina in the city. Two hundred meters to the railway station and bus station which connects Cagliari to the cities and the villages of the island. Only a hundred meters away, the passenger port that connects Cagliari to the top destinations on the European Continent and North Africa. The Miramare Hotel in the Marina district, the characteristic historical area of Cagliari, the center of the island's capital of gastronomy. You'll find bars and taverns, fine restaurants and real gourmandisserie temples, as well as craft shops, art galleries, local shops. Hotel Miramare, overlooking the ancients arcades of the city and facing to the church and the cloister of the Padri Minimi Francescani, followers of St. Francis of Paola. Certainly a very peculiar structure, built in the only place of the waterfront miraculously escaped at Anglo American’s bombs in March 1943. The style reigns supreme in this small charming auberge, where rooms are fully furnished with Art Nouveau and Art Deco-traditional Sardinian-urban of the first years of the last century. From 2010 young Sardinian artists have created unique works of art that underline the common areas with grace and ceilings, in a competition that brings the symbolic relay to be the first art hotel in Cagliari and forge new ideas and creations.